English Affair split horses in late stretch to score a half-length victory over Amboseli in Thursday’s 45th running of the $100,000 Cardinal Handicap (Grade III) for fillies and mares on Thanksgiving Day at Churchill Downs. English Affair, a 4-year-old filly owned and bred by Brad Kelley’s Calumet Farm, ran 1 1/8 miles over “yielding” turf in 1:54.26 to collect the first stakes win of her career. Corey Lanerie rode the winner for trainer Rusty Arnold II. Breaking from post position No. 5 in the field of 10, English Affair raced in mid-pack as 37-1 longshot Unbridled Escape dictated the pace through fractions of :24.79, :50.62 and 1:16.91. As the leader weakened on the far turn, 3-2 favorite I Remember Mama rallied wide with Amboseli just behind her. 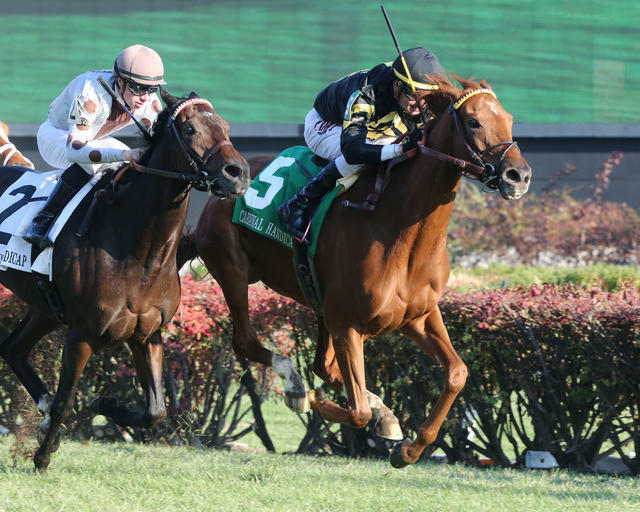 Lanerie and English Affair patiently waited for a room along the inside hedge and swung out at the top of the stretch when an opening never materialized. I Remember Mama had a half-length advantage with La Manta Gris just to her inside and Amboseli on her right hip. English Affair found room between the tiring La Manta Gris and leader I Remember Mama, and grabbed the lead with a sixteenth of a mile left to run and edged clear for the victory. The triumph was worth $58,900 and increased the Kentucky-bred’s earnings to $197,643. She boasts a record of 3-5-1 in 12 starts. Previously, English Affair was placed second in the $125,000 Dowager (GIII) over 1 ½ miles on turf at Keeneland. English Affair, who carried 117 pounds Thursday, returned mutuels of $8, $4.80 and $3 as the 3-1 second betting choice. Amboseli, ridden by Florent Geroux at 117 pounds, returned $6.80 and $3.80. Third-place finisher I Remember Mama, under Brian Hernandez Jr. and 118 pounds, paid $2.60 to show. The order of finish was completed by La Manta Gris, Coachwhip, Coco Channel, Lipstick City, Bonnie Arch, Unbridled Escape and Space Cadet. English Affair is a daughter of English Channel out of the Colonial Affair mare Lady Melesi.